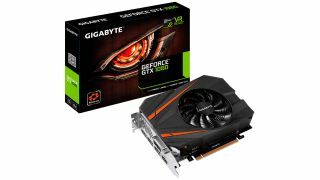 Gigabyte has unveiled the smallest Nvidia GTX 1080 card ever built, the GeForce GTX 1080 Mini ITX 8G, which at just 6.7 inches (169mm) means it can be installed in small PCs using Mini-ITX cases – perfect for building a console-sized gaming PC for your living room. Released last year, the GTX 1080 is still an incredibly powerful graphics card, capable of pushing graphics the Xbox One and PS4 could only dream of. The GeForce GTX 1080 Mini ITX 8G is a lot smaller than other released GTX 1080 GPUs, which are around 10.5 inches (267mm) in length. To keep the GeForce GTX 1080 Mini ITX 8G so small, Gigabyte has added copper composite heat pipes, along with a 90mm fan that sports a custom blade design. 3D Active fan technology will keep the card quiet as well – another win if you’re thinking of putting this into a living room PC. Gigabyte hasn’t announced price and availability just yet, but we’ve asked for more information and will update this news once we’ve heard more.